Posted by Hughes Group Blog Team on Thursday, November 29th, 2018 at 10:14am. The holidays seem to bring out the creative side in people. Many of these creative folks take advantage of this time of year to express these creative urges through decorating their homes, specifically their yards. As you drive around the Treasure Valley it’s not hard to spot these masterpieces. Some are elegant and minimalistic while others are whimsical and full of fun festivities. Each year it seems as if neighbors fall into competition with each other for the most creative and quirky displays. This, no doubt, is spurred on by department stores who readily supply these creative geniuses with the latest in holiday decorations. Tradition dictates to many the longing to experience these displays of stunning successes. If you’re one who shares that longing, then hop in your car and take a tour. “But where can I find these works of art?” you might ask. Never fear, someone, out of the kindness of their heart (and probably at great expense of their time) has put together a map for those who enjoy viewing these masterpieces. To find said map click the link at the end of this article. The map shows a variety of light displays. Those marked with a green tree are displays which are now open to the public. The yellow music note shows displays with music to go along with their show. Most of these displays will have a sign in the yard indicating a radio station you can tune to for the music that goes with the presentation. These types are kinder to the neighbors. The green picnic bench denotes that it is a community display. To the left of the map you’ll find addresses for each of the displays. On the map you will also find there are displays from Boise to Caldwell, and from Emmett to Kuna. Most of the displays seem to be in the Boise and Meridian areas. In addition to the map you can also find a facebook page dedicated to these spectacular displays. To go to this page, click the second link at the end of this article. On this page there are short teaser videos of some of the displays. They will give you a taste of what they look like and what type of Holiday music they are using. If you prefer a more classical rendition of holiday music then you’ll want to include on your tour the display on Zircon Ave in Meridian. For those who like a more exciting sound then you’re in luck. Many of the displays are accompanied by music that will help get you truly enthusiastic for the holidays. The display on Anston Ave. Meridian has a country theme to its music. At Crested Butte in Nampa you’ll find a waving snowman, and at Hickory Run Place in Boise, the music is the head-banging version of holiday carols. If these grandiose types of displays aren’t your style, but you still enjoy the opportunity to check out the holiday lights, then take a stroll around your neighborhood. You won’t be disappointed. Your neighborhood displays usually don’t have music to accompany them but they still carry with them a spirit of whimsy and joy. At many yards around town you can check out a wide variety of the blow-up decorations. Some of these varieties include Santa in an airplane, snow globes, a whole family of snow people, Rudolph and the Abominable Snowman putting a star on a tree, Santa in a helicopter, new this year is Santa watching over his reindeer as they eat from a trough of food, and many, many more to choose from. One yard’s display sports a flock of flamingos racing around the yard. Another yard has a cutout of The Grinch pulling the lights from the eaves of the house. Whether going for a big bold light display or for one that is smaller there is no end to people’s creativity. Where did this tradition of decorating our homes with lights come from? Some say it was the Germans back in the 16 th century who started the tradition of bringing a tree indoors and decorating it as a religious celebration. Others say it all started with Pagans who put up trees in their homes to remind them that spring would come. But, neither of these seem to truly explain decorating the great outdoors. It wasn’t until Thomas Edison invented the lightbulb that the bright idea of lighting the outside of your home really got started. He and his associate Howard Johnson created strings of lights in the late 1800. Johnson had walnut sized bulbs specially made for him. They were hand wired together and strung on his tree. But, back then, strings of lights were too expensive for the average man. They were only for the rich. It wasn’t until Albert Sadacca that people started decorating the outsides of their homes with these lights all in the name of celebrating the holidays. He is credited with creating the electric holiday lights phenomenon. 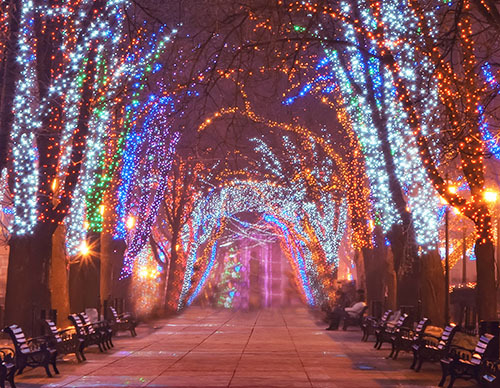 Previous to electric holiday lights, trees were lit by candles suspended from branches or held in place by melted wax. As you can guess, using candles was not a safe option and tended to cause many fires. Many people, intending to have a joyous holiday season, met with tragedy instead, losing everything they owned. The introduction of electric holiday lights has increased the joy felt at this season by making lighting our trees and our homes safer. Creativity seems to be synonymous with the holidays. People have fun using materials they already have or products offered them at department stores to bring to life their ideas. No longer do people have visions of sugarplums dancing through their heads at this time of year. Instead, they have dreams of combining strings of lights, circuit boards and music together to create the most exquisite display. One that will surpass all others. May each of us have a joyfully safe and beautiful holiday season. And remember to let your imagination soar.